This investigation of the overwhelming appeal of quantification in the modern world discusses the development of cultural meanings of objectivity over two centuries. How are we to account for the current prestige and power of quantitative methods? The usual answer is that quantification is seen as desirable in social and economic investigation as a result of its successes in the study of nature. Theodore Porter is not content with this. Why should the kind of success achieved in the study of stars, molecules, or cells be an attractive model for research on human societies? he asks. And, indeed, how should we understand the pervasiveness of quantification in the sciences of nature? In his view, we should look in the reverse direction: comprehending the attractions of quantification in business, government, and social research will teach us something new about its role in psychology, physics, and medicine. 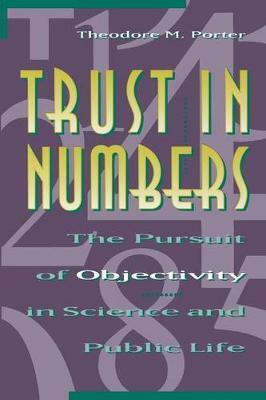 Drawing on a wide range of examples from the laboratory and from the worlds of accounting, insurance, cost-benefit analysis, and civil engineering, Porter shows that it is "exactly wrong" to interpret the drive for quantitative rigor as inherent somehow in the activity of science except where political and social pressures force compromise. Instead, quantification grows from attempts to develop a strategy of impersonality in response to pressures from outside. Objectivity derives its impetus from cultural contexts, quantification becoming most important where elites are weak, where private negotiation is suspect, and where trust is in short supply. Theodore M. Porter, Associate Professor of History at the University of California, Los Angeles, is the author of The Rise of Statistical Thinking, 1820-1900 (Princeton).